Concrete Central carries a wide variety of durable, high-density polyurethane trench drain systems, perfect for saving labor and cutting clutter and messes from your work. They're light-weight, easy to use, and can help you save time and money on your next project. 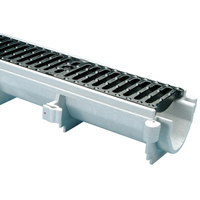 6 Inches wide, with a 4 inch throat, this trench drain is ideal for light duty work. 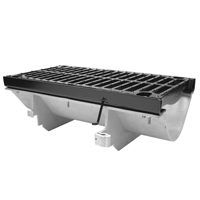 12 inches wide, with a 9.25 inch throat, this trench drain is ideal for heavy duty work. 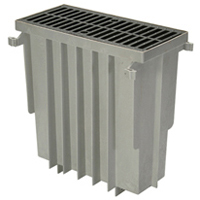 An in-line sump to connect with your draining system. The Zurn Logo and product names are trademarks of Zurn Industries, LLC. (c) 2013 All rights reserved.